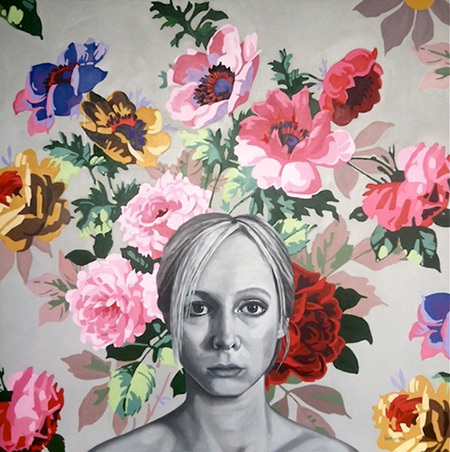 Katherine Rohrbacher, "Wallflower," oil on canvas, 60 x 60"
The subject of self-portraiture developed during the Renaissance with the help of the invention and usefulness of mirrors. It was a practice that only gained in popularity during subsequent centuries, as art became a commodity beyond the church. In the contemporary era, it’s a genre that is useful for artists to wrestle with their own identity and introspection. In Katherine Rohrbacher’s recent body of work she contributes to this lineage, holding a metaphorical mirror to her personal, physical and emotional struggles over a period of time. Pattern together with unusual objects or contexts symbolize these issues and accompany a fairly regular and stoic demeanor. While the artist herself maintains a melancholy yet brave posture throughout the series, they come across as quirky and delicate, which makes them easily accessible. A bare shouldered Rohrbacher epitomizes the unusual energy of her self-portraits in "Wallflower." The artist stares out of the square format with glazed eyes, as though she is looking directly past or through the viewer. Her pulled back hair, plain features, and lack of emotionality contrast the exuberance of color exploding in the form of stylized flowers directly behind her. Forming a makeshift headdress, the implied wallpaper is anything but background and instead fights for the attention of the perfectly centered artist. The play between the colorful exuberance and the artist’s grey scale portrays this shy demeanor and suggests an inability to socialize. Yet the strength of the work is Rohrbacher’s understanding of composition and the power of the center — features that make her stand out amid the colorful noise. Rohrbacher gets religious in "La Petite Fleur," where she re-imagines herself as a nun by donning the traditional garb of a woman who has dedicated herself to vows of chastity, poverty and obedience. Holding a crucifix and stems of roses that loosely fall from her grasp, the floral patterns extend into her clothing and the background, forming a rich and layered Victorian-like texture. The symbols of faith and devotion are clearly present; Rohrbacher’s religious zeal as expressed here may reflect a deep personal commitment. It is a faith unseen, and made all the more clear by her actions. In the self-portrait entitled "Lupus" the artist again centers herself in the composition. The blank faced depiction is now colored and she is wrapped in a red blanket that appears to offer comfort, an act that renders her less exposed. The unusual detail is a wolf's head the artist wears as a makeshift hat. Balancing precariously on her head, the wolf’s eyes also looks directly at the viewer. The disease, lupus, is Latin for wolf and it’s clearly connected to the artist as something she must carry on a daily basis. The chronic autoimmune disease is a condition where the body’s immune system attacks healthy tissue. The flare-ups are unpredictable and often last for many weeks and sometimes several years. The symbol of the wolf is also complemented by a constellation of the same name (lupus), which floats in front of the artist. The brave animal looks like it can be used as a mask, with the potential to hide the artist’s true self. Like the constellation it also is beautiful, robust, and full of mystery. Rohrbacher’s earlier work features several elements included in this current manifestation, like the intricate patterns that resemble wallpaper and the glitter filled compositions. Past work also feature complex detail and odd juxtapositions of framed images depicting images of wolves or birds. Her visual vocabulary has evolved, but the current portraits in particular express a vulnerability that’s convincing. Given the works' frankness, Rohrbacher disarms us with a steadily building narrative that reveals and separates her internal struggles and issues. The effort feels painful but also necessary. A smaller grouping of paintings titled “Distill” further hints at this process. Each image shows the artist looking upward out of a body of water, probably in a bathtub. They are carefully cropped and only reveal her face as the artist’s eyes, ears, and mouth gently rise out of the liquid. Distillation is a process that separates substances through evaporation, a potential healing mechanism or extrication process that exposes her struggles ever so gently to the viewing public. Rohrbacher methodically sheds a bit of her struggles in each work in this exhibit, slowly revealing a cumulative intensity.